Gilbert Botello is dead. But who killed him? Was it the butler or the maid? Was it the eccentric tycoon or his son? Detective Roy Rodger Kalauakekahuna III and his sidekick Officer Billy Souza investigate the murder and astonishing events surrounding the untimely demise of Gilbert Botello in this comedic murder mystery. Peopled with recognizable characters, Who Killed Gilbert Botello reshapes the typical British whodunnit into a refreshing representation of Hawai‘i. Kumu Kahua Theatre proudly invites you to an interactive Murder Mystery Fundraising Party for The ARTS at Marks Garage! We'll begin at The ARTS with a live, interactive escape-room style murder mystery, then walk to Kumu Kahua Theatre to watch Who Killed Gilbert Botello? with priority seating. Pupus provided by Bethel Union and your first drink at The Bar At Marks Garage is on us! Amos and Juliette Cooke had the best intentions. In 1839 Honolulu, the couple was deeply honored to be chosen to personally oversee the education of the children of the kings and queens of Hawai‘i. But how does one enforce rigorous discipline on a sacred ali‘i child? When is education a form of imperialism? Inspired by historical events, Wild Birds tells the story of intense cultural clashes, the effects of western education on the indigenous monarchy, and the ultimate disillusionment of a teacher. Pre-statehood Honolulu, 1956: despite recently unionizing, Alex and his three best friends desperately struggle to provide for their families. Joined by a mainlander, the four local men decide to violently pressure their company's boss to meet the union's demands. When money is always the bottom line, can idealism and friendship ever win? Celebrated and ground-breaking, Edward Sakamoto's Dead of Night is a suspenseful thriller about economic reality and the death of idealism. 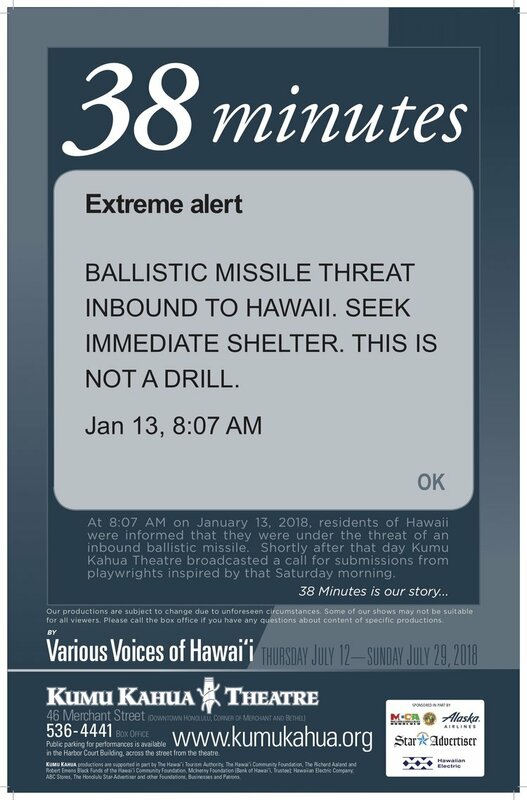 At 8:07 AM on January 13, 2018, residents of Hawaii were informed that they were under the threat of an inbound ballistic missile. Shortly after that day Kumu Kahua Theatre broadcasted a call for submissions from playwrights inspired by that Saturday morning. Presented by an ensemble of actors, 38 Minutes’ first act is a culmination of select scenes and monologues that were submitted. The second act is improvised, shaped by audience feedback on their experiences of those 38 minutes, directed and facilitated by the skilled and experienced duo, Monica and Squire Coldwell.